Young children are creative because they’re not afraid to be. This idea inspired DaySpring Cards’ Creative Greenhouse program. 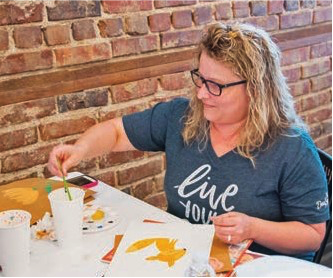 “We took that idea and said ‘What if everybody, regardless of skill, was given an opportunity to be creative?’ ” explained Brenda Turner, vice president, communications and administration, DaySpring, a Hallmark-owned greeting card company in Arkansas. The main goals of the Creative Greenhouse are sharing DaySpring’s creative knowledge about cultivating creativity and making quality instruction accessible to community members and employees, regardless of their skill or experience. The initial idea took root in early 2016, with classes officially starting in 2017 with topics as varied as hand lettering, clay modeling, cartoon drawing and watercolor painting. In its first year, the program reached more than 800, including a mix of adults and children, from 10-year-olds to senior citizens. DaySpring covers the funding and operational hours, with no outside sponsorship, charging only a nominal fee for supplies. What started as an internal continuing education enterprise has grown into something that feeds the artistic souls of the community and aids DaySpring in recruiting graphic artists from nearby John Brown University and the University of Arkansas. The Creative Greenhouse has also been a part of several local festivals, where artists demonstrate various styles of art and hand lettering and operate a card-sending station. DaySpring is keeping the Creative Greenhouse momentum going in 2018, offering classes on creative writing and a continuing focus on community outreach opportunities. Download and read more from our full 2017 Caring In Action Report here.